The last three articles on cold weather ventilation focused on checking for leaks, controlling air flow, and monitoring gas levels. In this final segment of the series, we will head back to the basics of ventilation by considering temperature and humidity management during cold weather. When the temperatures outside drop, it’s important to keep the barn temperature comfortable and consistent, especially during the first days and weeks of life. If you are unsure of the temperatures to maintain for various aged birds you can consult the Hybrid temperature guidelines. Young birds, especially freshly placed poults, are most susceptible to the effects of temperature. Before your poults are delivered, Hybrid recommends pre-heating your barn for at least 24-48 hours and up to 72 hours during extreme cold. Floor temperatures in particular are important. Bedding acts as an insulator, and it can take prolonged time to build heat deep into the bedding material. 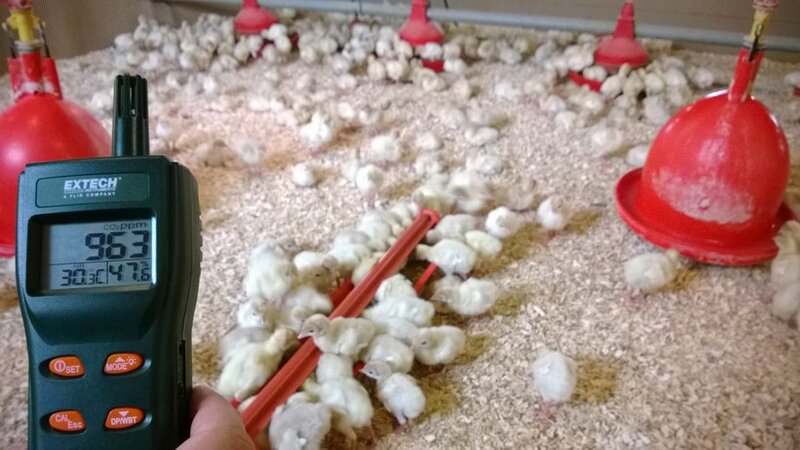 Cold floors can quickly reduce the body temperature of a poult and negatively affect activity, and in turn, feed and water consumption. The goal should be to have consistent floor temperature across the feed and water lines. 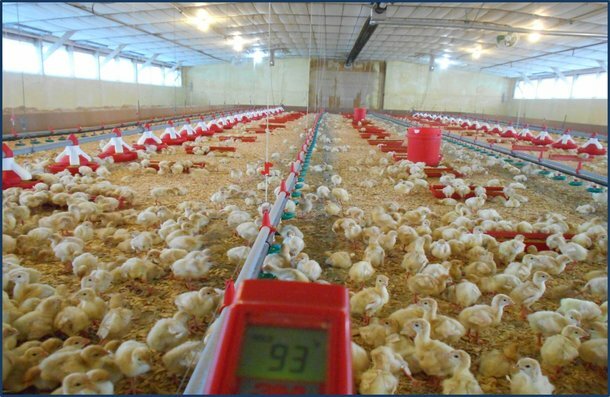 The heat source should create floor temperatures ranging between 90⁰-95⁰F (32.2⁰-35⁰C), at placement, allowing the birds to be most comfortable in the feed and water space. Stove temperatures that are set too high, have inconsistent heat cycles, or do not properly project their heat can create hot spots that can exceed the poults’ needs. To maintain appropriate temperatures, look at the footprint of heat distribution created by your stoves. Both overheating and cooling can result in large numbers of flip-overs at a young age if left unchecked. Use of a thermometer to check vent temperatures at placement and post-placement can help to monitor these issues and identify when to modify conditions. As your birds grow into the next stage of development, managing humidity becomes increasingly important, especially during the cold season. Managing moisture becomes a key factor to ventilating turkey barns during cold weather. Excess litter moisture can lead to ammonia and bacteria build up that can result in leg issues. For every 1 lb (0.45 kgs) of feed intake, a bird will drink approximately 2 lbs (0.91 kgs) of water. Approximately 80% of that water consumed ends up in the litter or in the air. This moisture must be removed from the barn in order to maintain dry litter and acceptable humidity levels. Proper ventilation can accomplish this, and do so, without chilling the birds or wasting fuel. Running fans, in conjunction with the use of inlets, within the barn creates a water pump system to remove moisture. The timing of your fan will differ depending on the size and power of your fan, the number of inlets, density and age of the flock. Additionally, when you have followed the steps previously outlined in this series on cold weather ventilation, the air exchange will pick up and remove moisture through the negative pressure fans, making them function like a water pump. The level of moisture in the air is controlled by the amount of time the fans run. Many on-farm systems offer assistance to control the inside environment using tools such as probes for temperature monitoring. When using probes or handheld tools it is important to consider where you are taking the readings in order to correctly understand the results you see. It is of utmost importance to consider the effect at bird level. A benefit to on-farm systems is that they allow you to set applicable temperature ranges, for example, with automatic adjustments or alarm notifications to keep you informed at all times on the environmental conditions inside your barn.